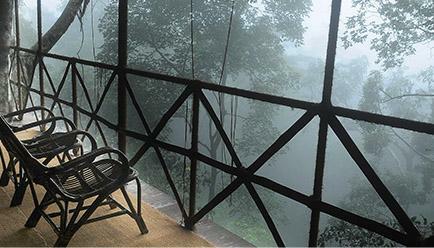 Experience the diversity of magnificent landscapes and lush tea plantations to trees filled with peppers or rice paddies – that is how the quaint little town of Wayanad welcomes you. 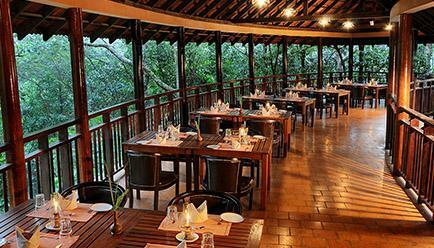 Perched on top of a hill, the exquisite Vythiri Jungle Resort is spread over 150 acres. 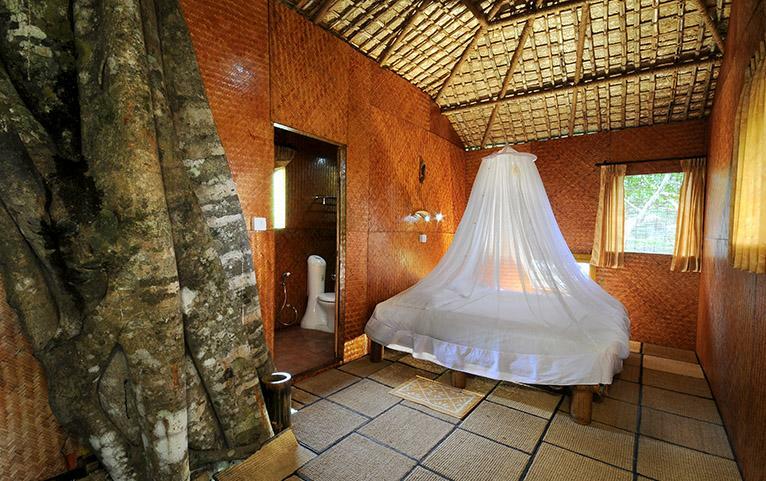 Surrounded by rainforest, the resort offers 18 cottages, 9 huts, and 6 rooms. With a stream running through the property, it is a treasure trove for nature lovers. 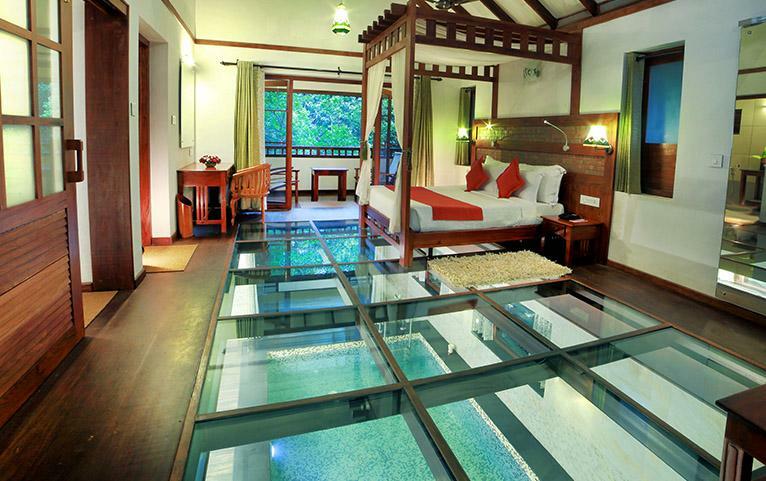 2 Nights Vythiri Haven - 41 sq.m. 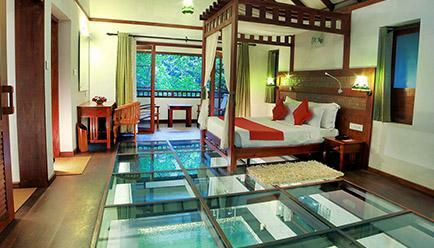 2 Nights Honeymoon Villa - 50 sq.m. 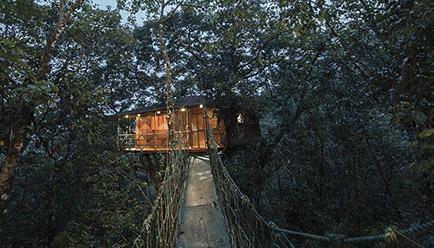 2 Nights Tree House - 19 sq.m. 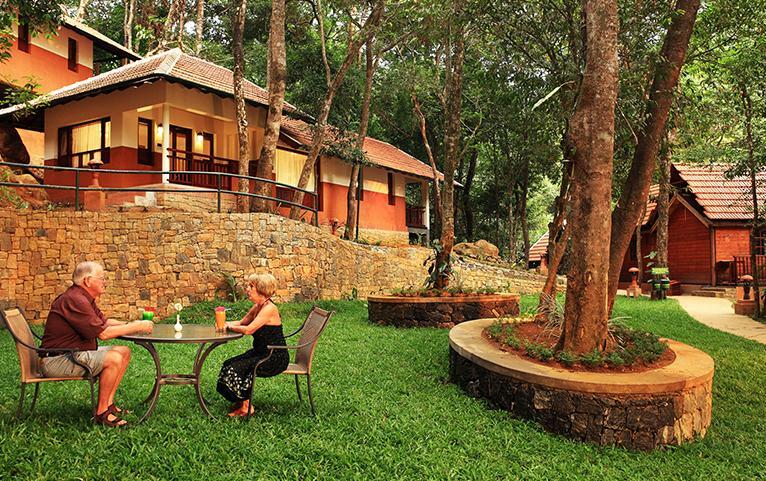 In the middle of a tropical rainforest, you will discover the Vythiri Resort with a rustic themed accommodation and yet all the luxury amenities that you would expect at an extravagant holiday. The chatter of cicadas and the gurgling of the stream will teleport you to paradise. 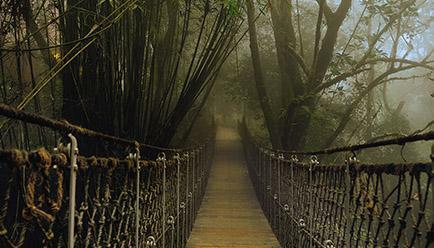 Located away from the classic tourist route, Wayanad allows you to see beautiful plantations, abundant wildlife and all off the beaten track. 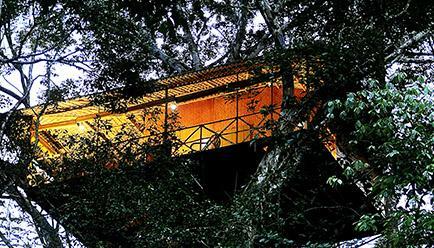 Although modern and beautifully architectured it offers the jungle to you. 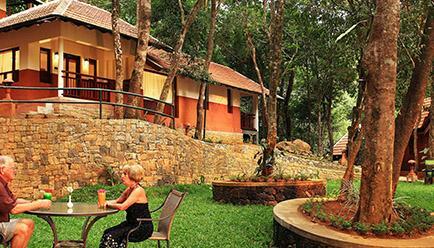 The elegant and exclusive Vythiri resort is set amongst the forest and hill. 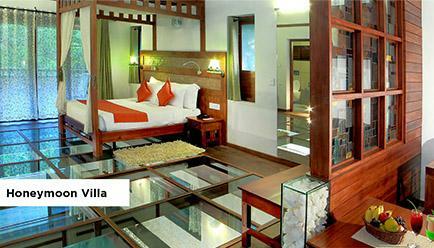 With state of the art amenities blended with a palette of earthy tones, the only sound you’ll hear is that of silence. 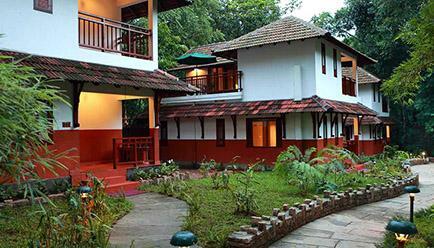 Vythiri Haven - 41 sq.m: Wherein your window opens to lush tropical beauty and a gurgling stream, these cottages offer you a home away from home. Spacious sitouts make the ambience to enjoy some quality time with your loved ones as you watch the sun rise and set. 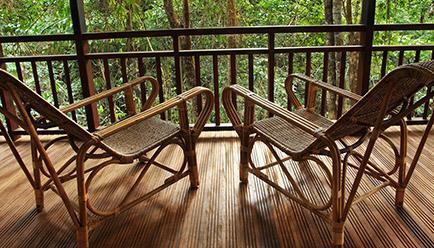 Honeymoon Villa - 50 sq.m: A wrap around large balconies overlooking the mountains and the stream provides the perfect setting for romantic evening meals or morning coffee and jungle bird song reverie. 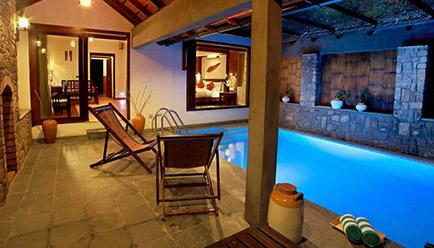 Slip into the arms or your loved one in the hot water Jacuzzi or take a plunge in your private pool. 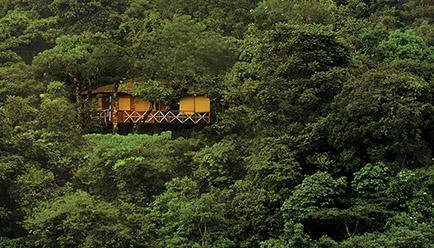 Tree House - 19 sq.m: Nestled atop the panoramic rainforest, the quaint thatch roofs and rustic walls take you back a few centuries to experience the slow yet meaningful life. The scenic view makes you appreciate life in its best and luxurious form with the ones who matter the most. Availability: To confirm your dates of stay at purchase, click on 'Book Now' and select your preferred package. Use the calendar to browse and select available dates. Dates with a surcharge and blackout dates are identified. 7-day Change of Heart Refund Policy: We always have one deal better than the other. So we understand your change of heart. Within 7 days of purchase, we’ll happily give you an option to cancel your booking, with a full refund, as long as the cancellation date is at least 30 days before the arrival date. For cancellations after 7 days of purchase, the hotel’s cancellation policy and penalty apply. Change of Date: 1 change in dates is permissible at no additional charges, provided that the change is made at least 30 days before the original arrival date and provided that the hotel has availability on the newly requested dates. The final decision regarding date changes is at the sole discretion of the Hotel and the Hotel reserves the right to decline a change in dates, should availability not exist on newly requested dates. Maximum Guest Capacity: The maximum room capacity is two adults and one child aged below 12 years or three adults, with the exception of the Honeymoon Villa where only two adults can be accommodated. See the ‘Extra Guest Policy’ and ‘Child Policy’ for more details. Extra Guest Policy: Where applicable, an extra adult can stay at a surcharge of INR 5,000 per night, which includes extra bedding and the inclusions available in the package, payable directly to the resort. Child Policy: A child aged between 0-5 years may stay free of charge. 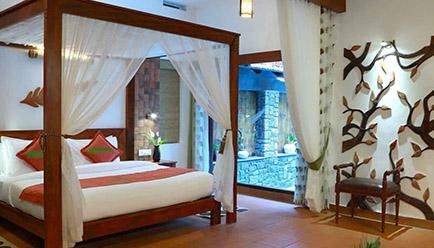 Where applicable, a child aged between 6-12 years may stay at a surcharge of INR 1,500 per night (for Vythiri Haven) or INR 2,500 per night (for Tree House), which includes existing bedding and the inclusions available in the package, payable directly to the resort. Extra bed can only be provided for children/adults above 12 years. Each room can accommodate up to 1 extra bed. Extra bed provided would be a roll down mattress and not a cot. No connecting rooms are available. Laundry, Ironing and Dry-cleaning Service: Ditch the worries of getting laundry done when on a holiday. The service is available at a surcharge. Airport Transfers: Just to add a little more comfort to your stay, the resort arranges for your airport transfers, at a surcharge. Wake-up call service: Don’t stay up all night for an early morning flight. The wake-up call service will ensure you don’t miss your flight. Daily Housekeeping: Let the staff take care of making your bed and keeping your space in order with daily housekeeping. Dining: Overlooking the swimming pool, you have the multi-cuisine restaurant offering an array of local and international cuisine. Getting here is an adventure in itself as you cross the small swinging ropeway bridge across the stream that is your own, at the resort. 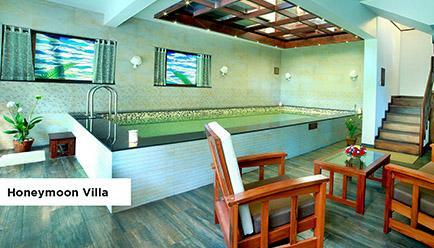 Spa: Eliminate stress with a rejuvenating massage and pampering session at the spa. 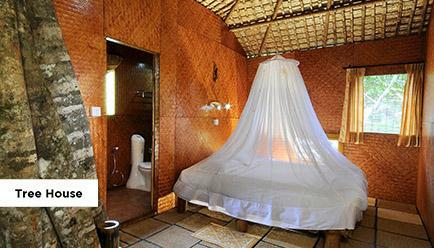 Other features: The resort spoils you for comfort and luxury with its amenities. From a natural pool, to kids game area, TV salon and a health club, you do not have to compromise on any of your desires when at the Vythiri resort. The nearest airport is Calicut, around 100 km from Wayanad and has flight services from several domestic as well as international hubs. A wide network of roads provide access to Wayanad from different parts of Kerala as well as Karnataka. Due to its terrain, there is no rail connectivity to Wayanad. The nearest major railway station is located in Kozhikode (Approximately 85 km from Wayanad).